Reports are doing the rounds today that Chelsea are heading the pack in the race to sign Atletico Bilbao star Javi Martinez. The 21-year-old combative midfielder is widely expected to leave Los Leones this summer after four impressive years at the club during which he has attracted interest from all across Europe – most notably from Barcelona, Real Madrid and Liverpool. Chelsea owner Roman Abramovich is willing to bankroll moves for players that will add some much-needed youth to his aging ranks and Martinez – one of La Liga’s hottest properties – seemingly fits the bill perfectly. To be honest, this post was just a thinly-veiled excuse to watch Martinez’ sublime goal against Almeria t’other week over and over again. 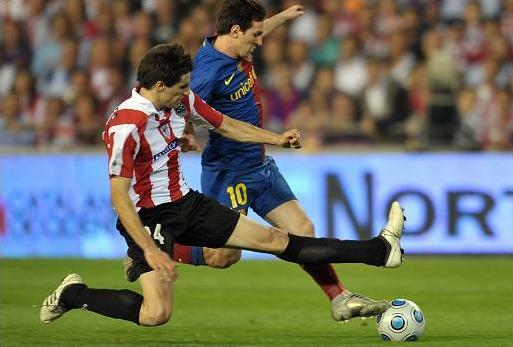 liverpool should have signed him while they had the chance, bilbao were even willing to accept lucas in a swap deal. the ‘actually good young centre midfielder’ ship has sailed. what if he offered to bomb a train?